Readers in search of an interesting biography should pick up a copy of Tiny Stitches. 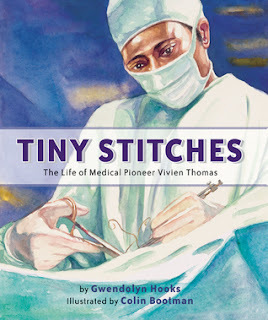 The informative picture book biography highlights the accomplishments of Vivien Thomas, an African American surgical technician and researcher who helped pioneer a procedure for performing open heart surgery on infants. Gwendolyn Hooks takes readers through the major events of Thomas's life growing up in Tennessee during the Great Depression. Due to economic hardships after the stock market crash, Thomas was not able to afford to attend medical school. He took a job as a research assistant at Vanderbilt University with Dr. Alfred Blalock. The pair left Vanderbilt went to work at Johns Hopkins where they performed the first successful open heart surgeries on infants along with Dr Helen Taussig. Bootman's realistic style watercolor illustrations bring a serious tone to the story. As Thomas and Dr. Taussig work to find a method for operating on babies, the author includes scientific details about the respiratory system that will satisfy curious readers. Middle grade readers will be surprised and saddened to learn that Dr. Blalock and Dr. Taussig received credit for pioneering the surgical procedures on babies. Thomas was not publicly recognized for his work until twenty-six years after the first surgery. Pair Tiny Stitches with Breakthrough! : How Three People Saved "Blue Babies" and Changed Medicine Forever by Jim Murphy. Putting this on my to-read list--thank you!! Thanks for this suggestion. I will putting this on my to-buy list. Thank you for writing about Tiny Stitches!